Horizon announces the simultaneous deliveries of two motor yachts, customised to the wishes of their owners, coming from the successful E84 and E88 series. 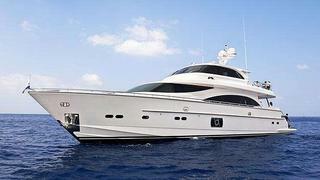 As reminder, the E88 is a 27.24m semi-custom motor yacht series built in composite with a modern design by John Lindblom. The version chosen in this case is the skylounge one, allowing more volume inside. The interior accommodates eight guests in a full-beam master suite, VIP stateroom and double and twin cabin. Powered by twin Caterpillar or MTU engines, her performance-oriented hull allows top speeds over 20 knots. Special feature on this new yacht includes a beach club aft of the tender garage and complimented by an hydraulic swimming platform. The E84 motor yacht, also in a skylounge version, had few customisations, one of them being a foldable radar mast due to bridge height restrictions in Perth, Australia. Built in composite, this Horizon E84 has a length of 25.91m and is designed by the yard’s in-house team. The interior accommodates six guests in a full-beam master suite, a VIP forward and a twin cabin. Powered by twin Caterpillar or MAN engines, she reach a top speed of 22 knots and a cruising speed of 18 knots. Both motor yachts are delivered to Australia.